I remember having a Fisher Price airplane pull-toy, and a school that came with a chalkboard and a tray of magnetic letters. But this Sesame Street playset was the best. I was so excited about it my mom let me look at it in the box before “Santa” wrapped it and put it under the tree. One of the most popular Little People playsets, Sesame Street, debuted in 1975, becoming the first licensed toy in the line-up. 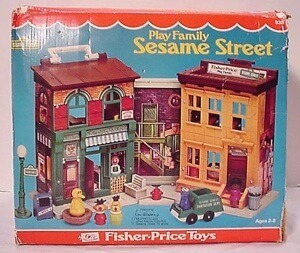 The playset was a recreation of the show’s urban locations, and included characters like Bert, Ernie, Big Bird, Oscar the Grouch, Cookie Monster, and the only three vintage Little People that were based on real people, Mr. Hooper (Will Lee), Gordon (Roscoe Orman), and Susan (Loretta Long). —Mental Floss. 17 Aug 2013 in Business, Culture, Design, PopCult. I still have it. I have all the Fisher-Price sets that Mom saved from the 70s, including the Sesame Street playset. If I could find replacement Bert on eBay . . .